Chronic sinusitis is characterized by recurrent episodes of facial pain and pressure; headache centered in the front of the face, a decrease in the sense of smell and /or discolored thick nasal discharge. It can be confused with allergic rhinitis, but unlike allergy does not respond to the usual allergy treatments – nasal steroid sprays, decongestants and/or antihistamines. The first step in Diagnosis is physical examination with nasal endoscopy. This involves using a telescope to directly examine the nasal passages and the area where the sinuses drain their mucous into the nose. Abnormalities such as active infection, masses and polyps (teardrop-shaped collections of inflammatory cells, fluid, and tissue that are covered by a mucous membrane) can be seen. Polyps can grow in response to infection, allergy, locations of abnormal contact, or for unknown reasons. 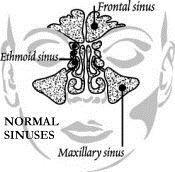 In addition anatomical problems such as a deviated nasal septum can be seen. The septum is the wall that separates the nostrils. It is made of bone and cartilage. If it is crooked it can cause narrowing and nasal obstruction. If it is severely deviated it can block drainage of mucous and lead to recurrent sinusitis. If symptoms persist after medical management including the use of antibiotics has failed and CT scan is recommended. A CT scan is a special x-ray that provides two-dimensional information about the sinuses. It allows for accurate diagnosis of sinus infection. Functional Endoscopic Sinus Surgery (FESS) is only performed after the patient has failed to respond to medical management. It involves the insertion of an endoscope, a very thin fiber-optic tube, into the nose for a direct visual examination of the openings into the sinuses. With state of the art micro-telescopes and instruments, abnormal and obstructive tissues are then removed. In the majority of cases, the surgical procedure is performed entirely through the nostrils, leaving no external scars. There is little swelling and only mild discomfort. The advantage of the procedure is that the surgery is less extensive, there is often less removal of normal tissues, and can frequently be performed on an outpatient basis. For those patients who have had prior surgery or extensive sinus disease, Image Guided Surgery with a special CT that provides real time almost three dimensional mapping of the sinuses can be performed to enhance the effectiveness and safety of the procedure. In most cases FESS only needs to be performed once. In those patients with undiagnosed and untreated allergy there is a risk of more surgery. Therefore, allergy evaluation either prior to or after surgery is recommended.